Want to use wired headphones with your new iPhone XS or iPhone XS Max? Sorry, apparently $1,000-$1,500 for a smartphone isn’t enough for Apple to throw in a headphone adapter anymore. If you want to use your wired headphones with your new iPhone, you’ll need to get a Lightning to 3.5mm audio adapter. Don’t worry though, we’ll do you one better. The Chooby Lightning to 3.5mm Audio Adapter lets you connect your regular wired headphones to your iPhone, and it also has a second Lightning port so you can charge while you listen to music. Or if you plan to only use wireless charging, you can get this adapter instead. 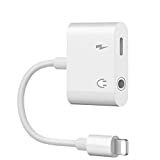 Support iOS all System: This adapter lets you connect devices that use a 3.5 mm audio plug to your devices, CellPhone 8/ 8 Plus/ CellPhone X/xs CellPhone 7/ 7 Plus, Cellphone 6s/ 6s Plus/ Cellphone 6/ 6 Plus, 6th Generation, Mini/ Air and More devices, Compatible with iOS 10.2/10.3/11.3/12 system or above. Lightweight and Convenient:Lightweight and easy to carry. Whether it is to travel or go shopping in peacetime, a small backpack can accommodate, and it does not take up any place. Free to Switch: it’s amazing fast.No need to install any plug-in, no Bluetooth, you just need to plug into,very convenient in operation. If you still want to listen through your old headphones, you can plug them in using a 3.5 mm headphone jack adapter. Stable Transmission Speed: Supports up to 48 KHz, 24-bit audio output,100% copper wire core with high-speed and stable signal transmission provides you better and comfortable experience, enjoy your favorite music, videos, or movies. High quality Aluminum alloy oxidation shell is more wear-resisting and corrosion resistance,ancing the anti-interference ability,High fidelity on the music. 12-month Warranty: 24 hours customer service online, Worry-Free 100% Money-Back Guarantee, 12 Months Replacement Warranty. If Any Questions Please Feel Free To Contact Our Customer Service.